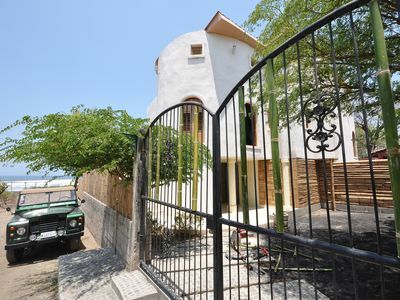 Salinas Grandes - Pacific Ocean Villa On A 2-mile, Virtually-private Beach! 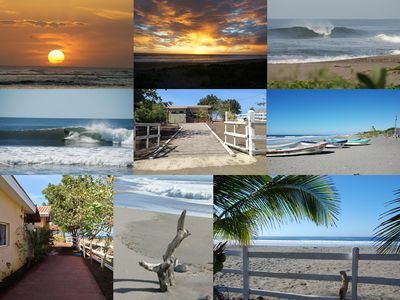 We are located in Salinas Grandes, on the Pacific Coast of Nicaragua, The fishing village of Salinas Grandes can be found, just south of Leon and the coastal towns of Las Penitas and Poneloya. 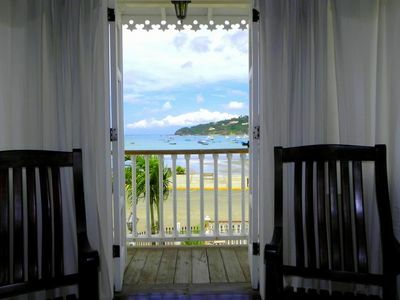 Our extraordinary home is located just 50 steps to the water on a rarely-occupied beach with a gently-sloping, rock-free ocean floor. 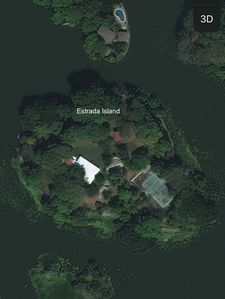 The property is a half-acre in size. 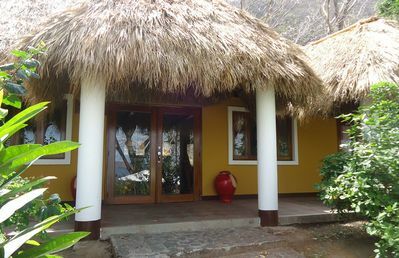 This is the place for a true, but comfortable, Nicaraguan experience. 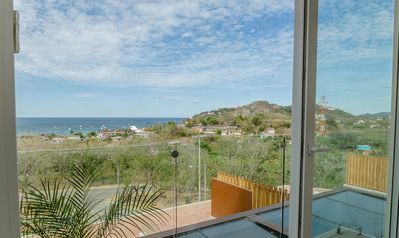 We have a rare combination of a naturally-pristine beach (with excellent surfing and within walking distance of the Isla Del Venado estuary), all the modern conveniences of a US-designed home with a/c, appliances, computer and magic jack phone can be used with modem), Sky Cable (many English channels), and the beautiful colonial city of Leon, just 12 miles away. Our single-story home, which sits on a ½ acre lot, has 3 bedrooms, 2 bathrooms, living room with large tv, dvd player, Sky Cable, 5-cd music player, and i-Pod speakers. There is adequate room on the couch for 2 additional people to sleep. The huge wood dining table seats 10. 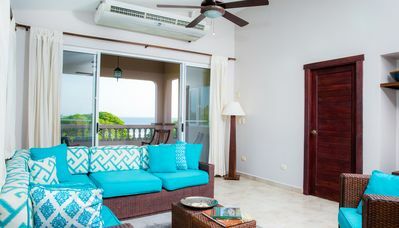 The master suite has a king-sized bed with built-in dressers and an open view to the beach (with attached bathroom), the second bedroom has a queen-sized bed with built-in dresser, and a built-in closet. 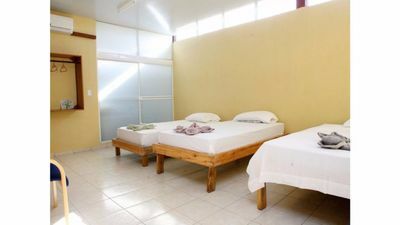 The third bedroom, which doubles as an office, has 2 twin beds, a large desk with a magicjack telephone that allows for free calls to and from the US or Canada. 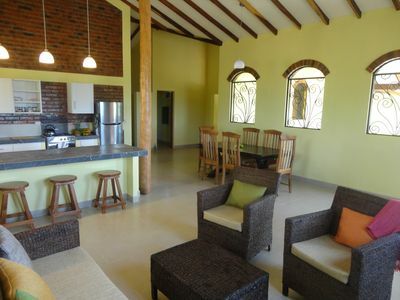 The bedrooms and living room are air-conditioned and have fans. 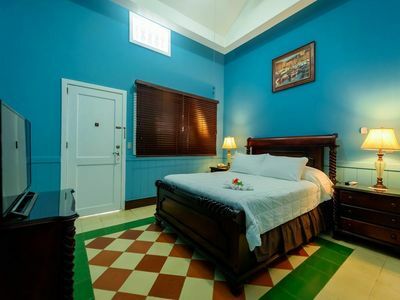 We also have a queen-sized aero bed at regular bed height for additional guests, Large picture windows, all with secure screens, allow you to open windows for fresh air. The modern bathrooms offer a safe, warm shower (US-style). The laundry room has a washer, dryer and freezer. The kitchen has a refrigerator/freezer, 6-burner stove and oven, microwave, juicer, blender, toaster, icemaker, and French-press coffee maker. We have an ice-cold water cooler (for 5 gal bottles of water) though our tap water is perfectly safe. The house has a full-home water purification system and you can safely drink water from the tap. While it is rarely needed, we also have a back-up generator that runs everything in the house should the power fail. 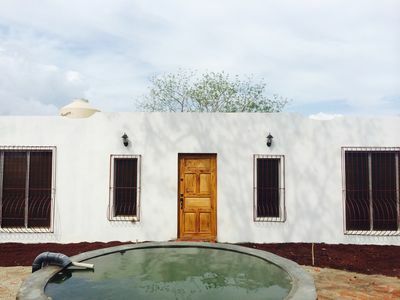 The outdoor rancho (next to the beach) has a clay tiled roof to keep you cool, a beautiful wrap-around-bar designed in shells, patio furniture, outdoor oven and barbeque. 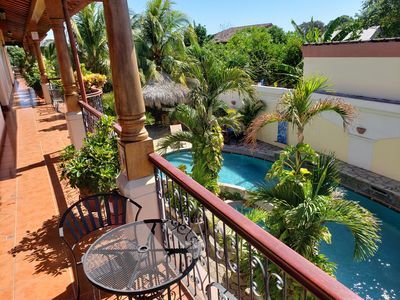 Our enclosed courtyard offers an outdoor living room, outdoor shower, surf racks, gardens and fans. 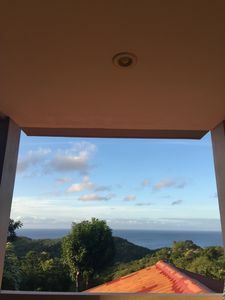 All areas are well-lighted and have water and electricity. Our full-time on-site caretakers (Marina and Sergio) provide 24/7 security and support and they fully maintain the house and grounds. Marina provides cleaning, laundry, and cooking services as you desire. Marina is an extraordinary chef, and we can provide you with a menu of favorites that she can prepare for you. As long as you pay the trip charge of $20.00, Marina will also be happy to go to Leon to shop with you or for you. Want to make a difference? Many of our guests long to give something back to the poor people in this remarkable country. We sponsor a grammar school in the nearby indigenous village, and are always anxious to share the story, and accept any donations you might like to bring. The children need typical school supplies and if you’d like to, you can deliver them directly to show your caring interest in the school. For those who are interested in helping, please contact me by email and I will be happy to provide you with additional information about current needs. 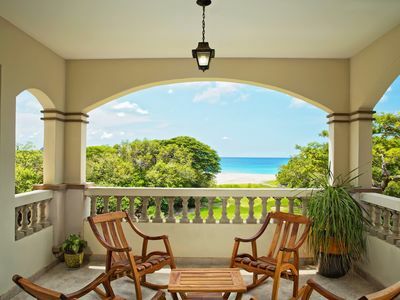 Transportation: we can provide you with our highly-recommended taxi driver who will pick you up in managua at the airport, stop for shopping, and bring you to the beach, or you can rent a car. Our friend Jose is completely trustworthy, speaks English and knows everything about Nicaragua. He is invaluable if you need to locate anything in Leon. You can arrange transportation, directly with jose. His telephone number is 505-8367-8326. 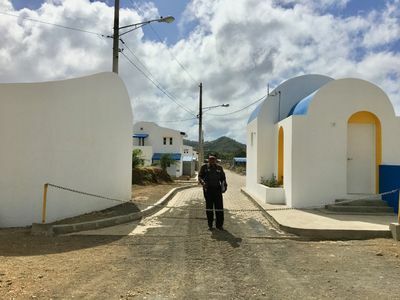 You can just tell him you are going to Kathy & Peter’s house in Salinas Grandes and he will welcome you like family. 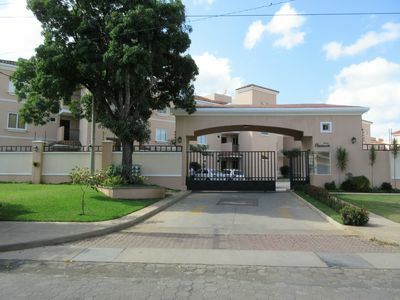 Rates from Managua, with a stop for groceries, start at $90.00 each way for up to four people. There are two beautiful grocery stores in Leon (like those in the us) where you will find what you need or you can be more adventurous and shop at the cathedral marketplace. We have contacts in a few other tour companies as well and can help you arrange sightseeing tours or other nica adventures. At the local Juan Venado Estuary you can see abundant wild life, including tropical birds, iguanas, crocodiles and sea turtles laying their eggs on the beach. If you are lucky, while you are here, you will have a chance to help protect some of these young turtles as they make their way to the sea. If you do rent a car, the entrance to Salinas Grandes is located on the highway to Leon, at km 77, and we can provide step-by-step directions at your request. 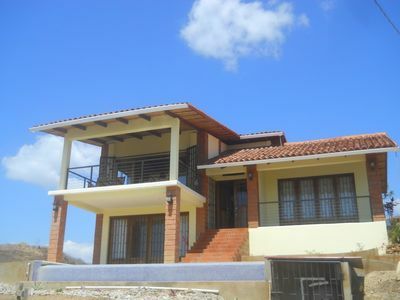 An elegant newly built 3 bedroom/2 washroom house. Surfing paradise. 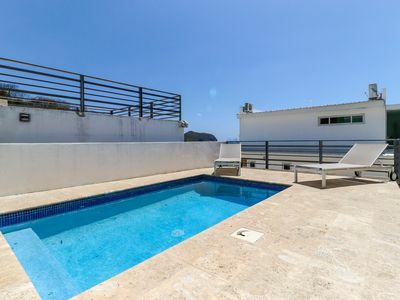 New Home/Casa, minutes to beach. Look No Further! Spectacular Island Retreat with Pool and Tennis nestled in a tropical setting. 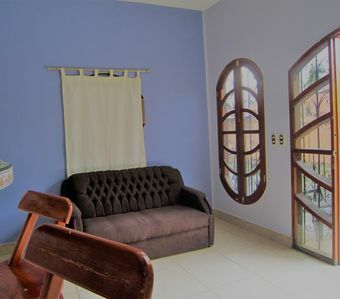 IN TOWN Private one bedroom apartment with AC just 3 blocks from the beach.